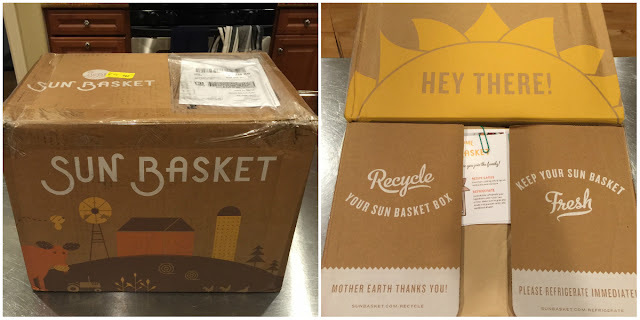 Sun Basket Organic Meal Delivery Review + Get $35 off! | Threads n Breads: Sun Basket Organic Meal Delivery Review + Get $35 off! Sun Basket is a new healthy meal kit service that delivers organic ingredients and delicious, easy-to-make recipes for cooking at home. Sun Basket makes it easy to cook healthy, with Paleo, Gluten-free and Vegetarian options, plus healthy breakfasts. 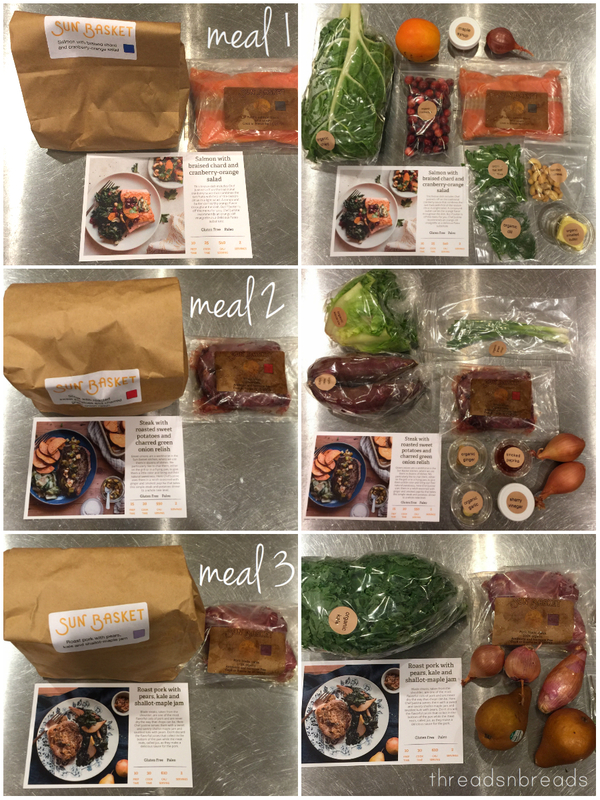 Get 3 recipes per week for 2, 4 or 6 people, delivered to your door in recyclable packaging that can be shipped back - free- for reuse. Currently, shipping is only available to CA, OR, WA, CO, UT, AZ, NV and ID. The product is carefully packaged to stay fresh in the box for up to 8 hours. They use 100% recyclable packaging including insulation within the box. Inside of the box, you'll find the produce for each meal separated into their respective labeled paper bags. Then underneath, there is a layer of cardboard before the vacuum-sealed meats are revealed. 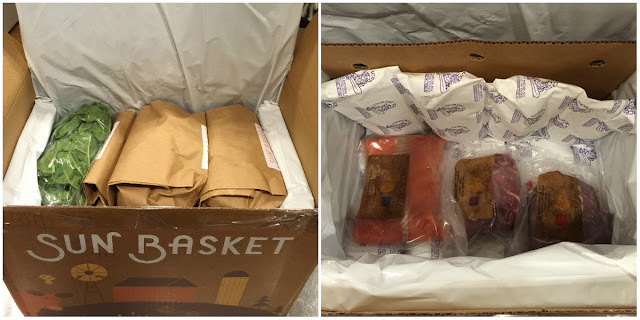 The meats are surrounded with ice packs to help keep everything fresh during shipment. They recommend putting everything in the fridge as soon as you get your package, but it should be good for up to 8 hours with all the packaging. The produce is all organic non-GMO from West Coast farms. The meats and seafood are hormone-free and sustainably sourced. Recipe cards are included for each meal and everything is labeled clearly so you can identify each ingredient needed for each meal. The recipes are created by Executive Chef Justine Kelly, formerly head chef at James Beard award-winning restaurant The Slanted Door in San Francisco. The meals I had were part of their Thanksgiving menu and had many seasonal ingredients to make these meals have that holiday feel. I really like the way everything was packaged. You could tell the produce was really fresh. Everything was clearly labeled and had clear instructions on the meats on when to use by or freeze by. I even held off on cooking one of the meals 5 days later, by the last day listed on the package, and everything still stayed very fresh. I also really enjoyed being able to work with different ingredients that I normally would not. I was able to try escarole and Swiss chard, two veggies I never think to try in my recipes. I really liked a lot of the sauce and toppings - they were simple but really elevated the dish. Each meal made me full, but not feel guilty since there was a healthy selection of protein and veggies. I would definitely try Sun Basket again for those weeks I don't want to think about what to cook. It was pretty therapeutic following recipes and stress-free having all the ingredients in the right quantities delivered to my door. The recipe cards were pretty simple, but since I cook pretty often I could follow along pretty easily. I would suggest that they add more step by step instructions w/ photos - this would really help clarify if I am prepping the produce correctly. They should add tips on how to work with certain produce. For example, I was really struggling when cutting up my sweet potatoes and found later hitting the back of my knife with my palm helped to cut thru the hard vegetable. Below are photos from my cooking process of all 3 meals. Overall I think this was a great service and I would definitely order from them. Use my link to get $35 off Sun Basket meals! It's a great value and you get to try new healthy recipes! Note: These are affiliate links. Let me know if you end up trying the service and tag me in your posts so I can see! In this new era, this world is immensely powered by the World Wide Web and that’s why the trend of online shopping has increased. So the entrepreneurs that sell products online have to deliver the packages to their customers at right destination and a good courier service is mandatory for that. I also use the same day courier service for my cake and flower shop and happy with their work.